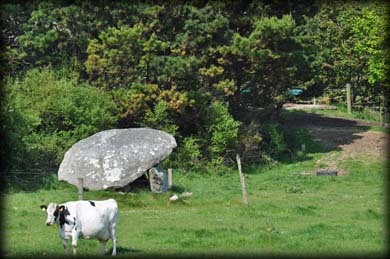 Situated about 200 metres west of Annestown Stream is Dunhill Portal Tomb. It is not the finest example of this type of monument. The nearby Gaulstown and Knockeen tombs are far more interesting. 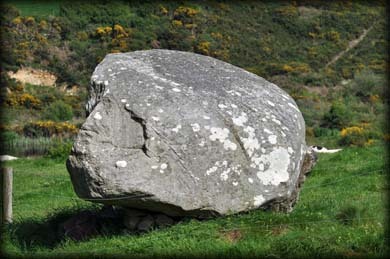 Nevertheless you have to be impressed by the size of the boulder like capstone. It measures 4m x 2.7m and T 1.2 metres approx. It rests on one of the portal stones; the other may be lying underneath the capstone. There are numerous other stones scattered around and under the monument but these maybe field clearance. Situated: From Waterford city take the R 680 southwest. Just before the Maxol Station take the left fork. Go straight through the roundabouts and keep on this road for Dunhill. After the village there are farm buildings on your left. The Portal tomb is in the next field. Discovery Map 75. S 5042 0218. Last visit May 2016.